v7 Beta and start testing now! 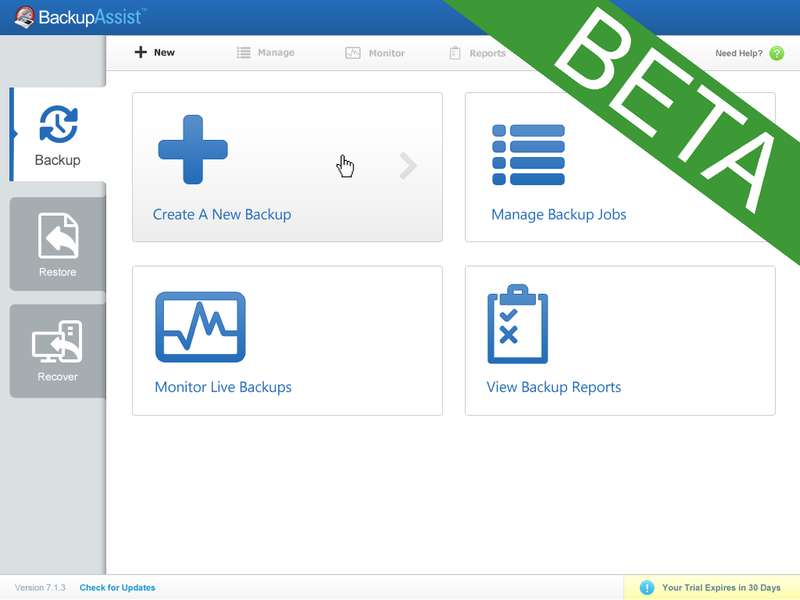 Now is your last chance to submit feedback before the live release of BackupAssist v7! BackupAssist v7 Beta is out now and we want to incorporate your feedback before the final release. We recommend that you read through the Quick Start Guide before installing and running BackupAssist v7 Beta. The Beta Quick Start Guide is available from the documentation link on the right hand side of this page. It contains important information and will answer many questions you have regarding the Beta. The document is divided into four sections. The Installer, the new UI, the Central Administration Console, and Guided Restore. We would like to hear feedback about bugs that may appear on your particular system. Our v7 Beta may have bugs and other limitations, therefore BackupAssist v7 Beta should only be used on non-critical computers for testing purposes (not on your production server). Please note, the BackupAssist v7 Beta is a 'non-supported' beta release and we will not respond to support enquires as we do for a 'released product'. Please do not email or phone our support center to request support. New to the BackupAssist Beta Program?